Noel Bennett Photography: Genesis - 3 Counties Photographic Exhibition Winner!! 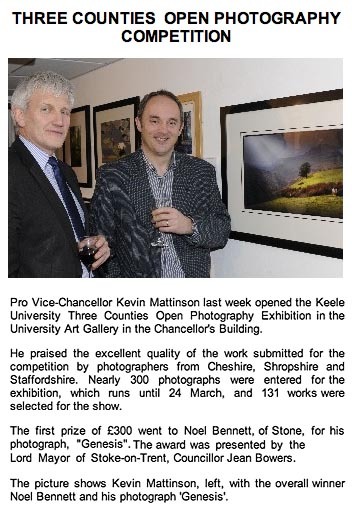 I was awarded 1st prize for my photograph 'Genesis' at the 3 Counties Photographic Exhibition at Keele, last night. All three of my entries were accepted, the other two being 'Fairground Reflection' and 'Hill House Deer. As if this wasn't enough excitement for one day, the Lord Mayer of Stoke-on-Trent bought my 'Genesis' framed print before the show even opened! Hopefully this will please Margaret and John Exton of Stone who were the first to purchase this image from me! Sales continue to do well at The Gallery On The Square in Stone.